In Alaska, as in other states, when a decedent doesn't make a will, his property and assets must be divided according to the state's inheritance laws. These laws, known as "laws of intestate succession," provide guidelines as to the priority of heirs and what happens to property when there are no heirs. When an Alaskan makes a will, he is free to leave everything to his spouse. Because Alaska is an "opt-in" community property state, property acquired while married is considered equally owned by both spouses if they have a written agreement. If spouses have a community property agreement, they cannot give more than their share of community property to a third-party in a will. If a spouse dies without a will, the surviving spouse inherits the entire estate -- both community property and separate property -- if the deceased spouse has no surviving children or parents. However, if the deceased spouse has no children, but has a surviving parent, the surviving spouse can only receive up to $200,000, plus three-fourths of what remains of the estate. Alaska's inheritance laws provide for children when a parent fails to leave a will. For example, if an unmarried parent dies without a will, his children receive all of his estate in equal shares. This means that if there are four children, each child is entitled to one-fourth of the estate. Furthermore, if the parent who dies without a will is married at the time of death, his children are entitled to a portion of the estate if his surviving spouse had children with someone else, i.e. children with a man other than the deceased, for example, an ex-husband..
Alaska's inheritance laws state that a decedent's other heirs -- such as siblings, nieces, nephews and grandparents -- receive all, or a portion of the estate under certain circumstances. For example, if a decedent has no surviving spouse or children, his parents inherit his entire estate in equal shares. If a decedent has no surviving spouse, children or parents, his entire estate passes to his siblings in equal shares; nieces and nephews may inherit "by right of representation" if their parents are deceased. If there are no surviving heirs whatsoever, a decedent's estate will pass to the State of Alaska. As a result of the Alaska Native Claims Settlement Act, Native Alaskans may own shares in one of the 13 Regional Corporations or a village corporation. Alaska Natives may leave their shares in a will to Native family members and non-Native spouses. If an Alaska Native owns shares, but doesn't make a will, all of his shares will pass to his surviving spouse. If he has children and a surviving spouse, half of his shares will pass to his surviving spouse and the other half to his surviving children. Kavilco Incorporated: Testamentary Disposition - Who Will Inherit Your Shares? In California, the term "heir" is defined in the state's probate code. Heirs are people who are entitled to inherit a deceased person's property. California, like other states, has laws that explain who may receive an inheritance when a person dies without a last will and testament. These laws are called "laws of intestate succession," and when a person dies without a will, it is referred to as dying "intestate." A person who dies without leaving a will is said to have died “intestate.” New York courts distribute intestate property according to a statutory scheme of succession and these laws apply only to property located in the state of New York. Laws of other states may apply to real property located outside of New York, even if the decedent had been a legal resident of the state. The intent of New York's intestate succession law is to distribute the estate in the manner in which the decedent likely would have had she left a will; the statutory scheme distributes the decedent's property to the closest surviving relatives first. How Much of a Husband's Estate Is a Widow in Florida Entitled To? 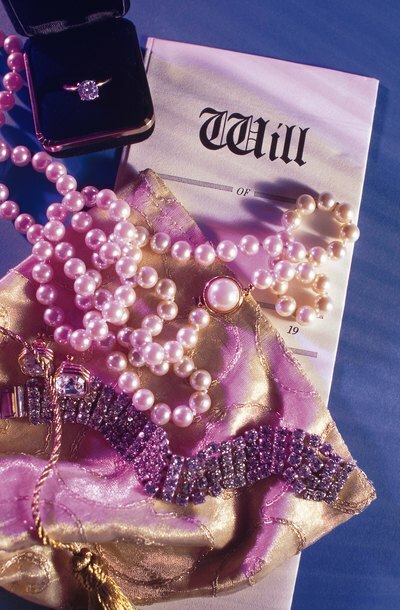 In Florida, a husband is free to leave everything to his wife in his will, if he has a will. However, if he doesn’t make a will – or if he makes a will but doesn’t leave enough of his estate to his wife – Florida law steps in to determine how much of the husband’s estate the wife is entitled to when he dies.